The article suggests that by expressing interest in a dish, you will encourage vendors or chefs to share a bit about how the dish is cooked. When I recently took a trip to Paris with my parents, I met several chefs and had the opportunity to learn about their cooking techniques. My discussions with chefs at Capella Padregal and Café Med stand out in particular. I have traveled to a number of diverse locations, including Paris, Cabo San Lucas, and Boston. Sometimes my family and I will eat at prestigious restaurants and other times we will look for unique restaurants that locals frequent. This allows me to try many new flavors and techniques that I can one day incorporate in my own cooking style. The article recommends finding offbeat meals at street food stalls, delis, hole-in-the-wall restaurants, and open markets. This image from the original article demonstrates how showing context can enhance the dish’s aesthetic appeal. The article recommends including drinks, condiments, or even other diners in the photo to give the dish some context. 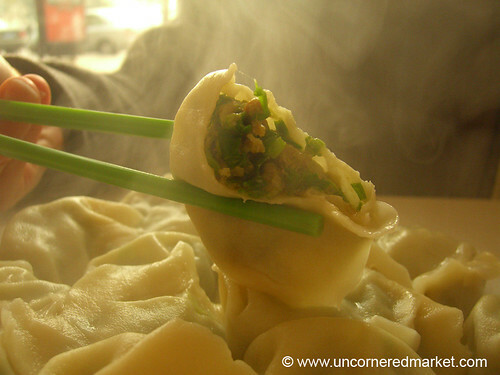 An example picture in the article, showing a pair of chopsticks holding a dumpling, helps illustrate this concept. I like the idea of using the photo to capture the atmosphere of the restaurant and the full experience of the meal but I would also suggest including side dishes.